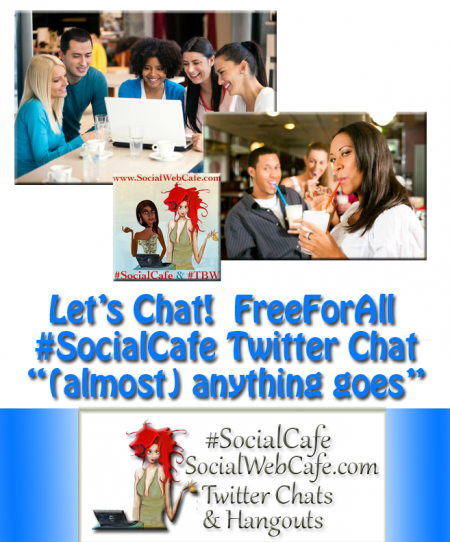 View the announcement for this #SocialCafe Chat..
#SocialCafe #TBW Twitter Party (w/ prizes)! What have you learned during this Twitter Chat/Twitter Party series? Either we are in a holiday spirit and excited for this season and all that it entails, or we enjoyed the season and finding fun crafts, etc. What questions do you have about Twitter Chats or Twitter Parties? It doesn't look like we have a lot of questions. We are just in the mood for fun! What will you be doing during winter break? It looks like there is a consensus on getting ready for what is to come in 2014. I know for me, personally, I will be relocating temporarily to NY (Deborah). Do you have any favorite pins, photos, posts, tweets, videos that you would like to share? Marisa is on a roll, isn't she? All sorts of great pins, crafts, foods. Check out the storify to see more of Marisa's recommendations! Thanks, Marisa! As always, we are here for you and looking forward to our final chat in 2013 and serving you in 2014! This SocialWebCafe Twitter Event is about Twitter Chat and Party Wrap-Up. We recommend them because we love them (and their tool) and not just because we are compensated. Try it for free! This week, for those of you who need some company on Christmas Eve, or don’t celebrate Christmas, Deborah will be available to chat during our weekly chat hour. This week can also be used as our wrap-up for our mini Twitter Chat/Twitter Party series. I know.. We had one chat and one party, but this is a good night to ask questions (or visit the archive later, to read answers). Time: 6:00 pm PST/PDT (9:00 pm EST/EDT). What changes (if any) will you be making in your Twitter Chat plans in the future? For more information on the formats of Twitter Events and what we recommend as tools to join in the fun, please visit Twitter Event Instruction. Have questions? Leave them in the comments or send a regular tweet to Deborah @SocialWebCafe.